When you are learning to draw, this observation exercise will help you to shift your mind over to the artistic side of your brain. This action stops your internal chatter which in turn gives you peace and helps you to concentrate more. The first thing you need to do is draw a line down the center of your blank page. Look for a drawing or picture of an object that is equal and in proportion on both sides. This search is actually a good exercise in itself - something that fits this description is called symmetrical. 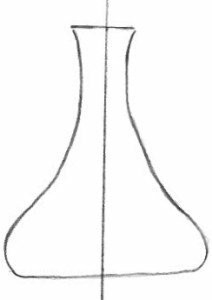 A vase or a bottle are typical symmetrical shapes. When you have a good and simple symmetrical subject to copy, draw a line down the center of the symmetrical item on the actual reference copy and place a piece of paper over one half. Of course, you need a nice big picture to make the copying process easier. Plain and simple objects are easy to understand, which is a strong factor in reproducing them successfully. Copy the uncovered half of the picture onto your paper, in outline format only. Make sure you are content with your outline before progressing any further. Take care that your lines that meet the center line look fairly accurate to enable joining them up successfully with the "blind" side. Now, put away or hide the original reference picture. Draw the second half of your drawing by copying from your first half. You are trying to create a mirror image. This observation exercise naturally requires good concentration and it trains your eyes to see the way an artist sees. You can also do this exercise using ordinary shapes, too - draw a star, a square, a circle and so on. When I felt I mastered basic shapes, I then drew a nesting doll to use for this experiment. The figure is more complex than circles or vases but I'm confident this type of practice will help with my overall progress. You can also try using a cartoon figure, that would be good practice as you get into the swing of things. The figure you choose has to be facing straight ahead and have exactly the same features each side for you to successfully copy a mirror image. Progress onto more complicated line drawings as you begin to master the simple shapes. 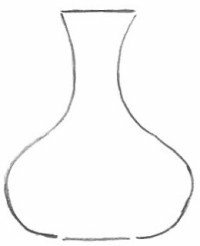 Draw the left side of a vase with the left hand and then draw the right side with the right hand, or vice versa, whichever is your preference. Ambidextrous drawing co-ordinates the two hands, as well as the mind, so that they work together freely and harmoniously. Through repetition, you gain skill, freedom and speed when you train yourself to draw with both hands. The symmetrical drawing on the right is one of my early attempts which is not entirely correct in proportion but I know I will be able to achieve better images with each and every one I complete. I thoroughly enjoy doing two-handed exercises but then again, I've yet to find a challenge that doesn't interest me due to all the hidden benefits. You have nothing to lose by trying it out anyway. Give the idea a chance to grow and perfect itself. As a gift, I was given the very first version of this book by Betty Edwards and it is an excellent guide for all beginner artists. It also contains similar exercises just like the one on this page because that is the whole focus of the book - to get your artistic brain motivated and into action. I had the best time doing the exercises and they really gave me the confidence to continue drawing. Make a mental note to re-read this book each year, it's amazing what you learn the second and third time around. The more I read it, it makes more sense and things just seem to fall into place. The observation exercise may look easy but once you experiment with it, you will find it is challenging to draw and copy a mirror image. We don't really learn anything unless we challenge ourselves, do we? The main objective is to enjoy the whole experience of this beautiful art form.